my drawing tablet adventures continue. 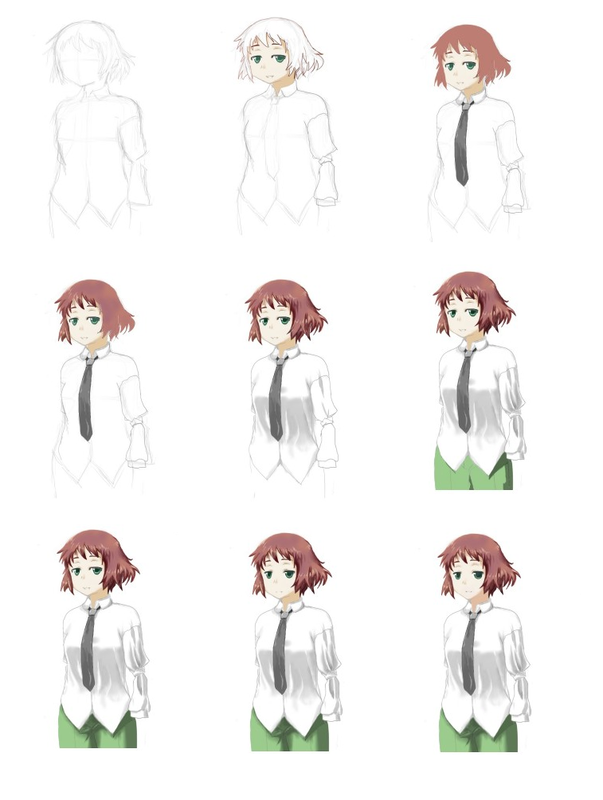 This time, I tried to do Rin from Katawa Shoujo. I'd gained enough familiarity with the tools in Sketchbook Express to know what each does, and when I should use each. Of the available tools, I probably used the airbrush and pen the most. Airbrush would have been used for soft transitions (shirt, pants, face), and pen took over for stuff like the tips of the hair and fine adjustments on the eyes. Chisel-tip marker and paintbrush were also used for fill-in. The result took several hours this time, but is a definite improvement over my previous attempt. Click for a larger view. 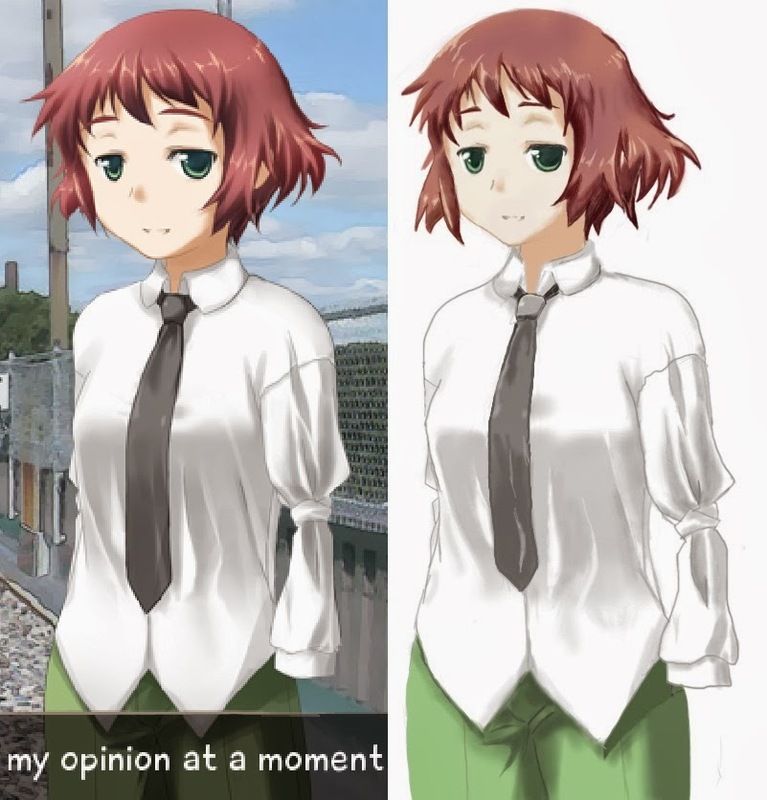 Instead of pinning the original reference image to the corner, I've put them side-by-side to make comparisons easier. If it's not obvious, my drawing is on the right, and on the left is the image I grabbed from the 'net. Also, sorry about the pixellation on the left; I used MS Paint to resize it. I think it's gotten to a point where I'm able to get a pretty decent likeness; it really does resemble the reference image on the left. It went through a lot of steps, took several hours, and I actually used layers this time. It's a little difficult to see details from here, but I do have some criticisms; issues I know are there, but was too far in to fix by the time I'd realized it. My original sketch had made the head too wide, so I tried to compensate by using the resize tool to squish it horizontally. I went too far and made the head a little too thin, and by the time I perceived it, it was too late; I'd already laid down a lot of color. The version you see now had as much adjustment made as possible. I think the colors are also a little mis-picked, particularly in the hair and face; the original is a bit warmer. Otherwise, it exceeded my expectations for a 2nd try with tablet drawing. This drawing made me realize just how crucial eyes are. Like, I already knew that (see the Sora picture I posted a few weeks ago), but it makes a bigger difference than I'd even realized. A few pixels are the difference between your character looking left and looking right, sad and angry, or normal and cross-eyed. Of all the things that I'd had to give attention to, that wound up taking the most time, from the sheer number of times I had to go back and fix them. 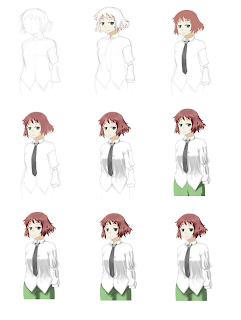 I also made sure to save separate copies intermittently; I thought it would be nifty to see the progress. You can see how on the third drawing I made the decision to squish it horizontally, and how the last 2 changes were entirely made to the eyes. The results this time are more promising than the last. While I'll never be an artist proper, I'm starting to exceed my own expectations, which is pretty cool. I wasn't really expecting to upload as much artwork as I have; I kind of thought I'd get bored, or run out of juice quickly, but ... here we are, and I don't feel like stopping. I'll probably wind up drawing all of the 5 main girls from KS eventually. For the next one, I'll probably switch back to DBZ or Final Fantasy briefly. Hope you enjoy.